Los Angeles, CA – The hard rock supergroup featuring French vocalist and guitar phenom Steph Honde, who anchored the band of original Iron Maiden vocalist Paul Dianno, and drum icon Vinny Appice of Black Sabbath and Dio returns with a brand new album of killer tracks! Capture The Sun ups the ante of the band’s highly acclaimed 2014 debut album offering even more killer riffs and outstanding songwriting as well as a superb cover of David Bowie’s “Sweet Thing/Candidate” from the glamtastic Diamond Dogs album. As always, this Hollywood Monsters joint features a TON of outstanding special guest performances including the likes of bassist Tim Bogert (Vanilla Fudge, Beck, Bogert, Appice), another Dio alum Tracy G, Whitesnake’s Neil Murray, Danko Jones, and many others! Los Angeles, CA – Drummers and music fans worldwide are buzzing with excitement about the new live CD track and music video by drum legends, brothers, Carmine & Vinny Appice, titled “Stand Up And Shout!” Drumming demi-gods Carmine & Vinny Appice have both had extraordinary careers behind the drum kit, beginning with Carmine’s tenure in such legendary classic rock bands as Vanilla Fudge and Cactus as well as supporting stints with Rod Stewart and Ozzy Osbourne. Meanwhile, younger brother Vinny made his name as a metal drummer for monster acts such as Dio, Black Sabbath and Heaven & Hell. Recently, these two drum virtuosos have been wowing audiences with their own rock show called “Drum Wars”, featuring not only the hits of their associated bands but also a thrilling series of solos that pit them against each other like the Gene Krupa/Buddy Rich drum battles of yore. Fortunately for us mere mortals, this unique concert experience was recorded in June 2014 at the Iridium in New York and is now available on CD courtesy of Deadline Music and Rocker Records. Along with Carmine and Vinny, the ‘Drum Wars Live’ CD features Jim Crean, Ethan Brosh and James Caputo! This January, Vinny Appice will be embarking on the Extreme Guitar 2015 North American Tour featuring Uli Jon Roth, Vinnie Moore, Craig Goldy, Elliott Rubinson, Vinny Appice, Mark Boals! 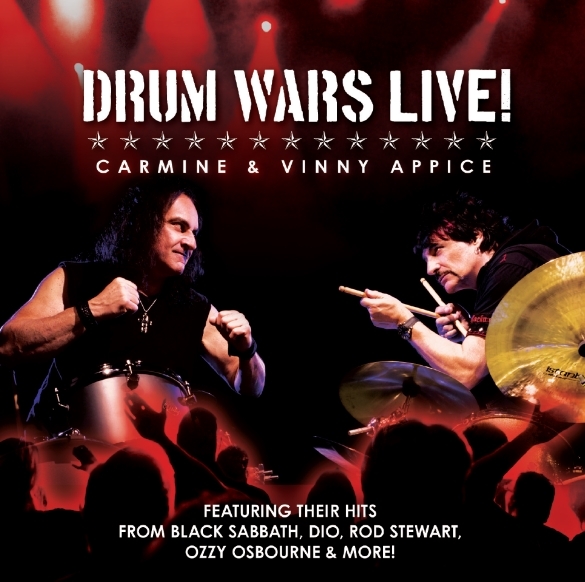 Drum Heroes Carmine & Vinny Appice Go Head-To-Head On The New Release Drum Wars Live! Los Angeles, CA – Drumming demi-gods Carmine & Vinny Appice have both had extraordinary careers behind the drum kit, beginning with Carmine’s tenure in such legendary classic rock bands as Vanilla Fudge and Cactus as well as supporting stints with Rod Stewart and Ozzy Osbourne. Meanwhile, younger brother Vinny made his name as a metal drummer for monster acts such as Dio, Black Sabbath and Heaven & Hell. Recently, these two virtuosos have been wowing audiences with their own rock show called “Drum Wars,” featuring not only the hits of their associated bands but also a thrilling series of solos that pit them against each other like the Gene Krupa/Buddy Rich drum battles of yore. Fortunately for us mere mortals, this unique concert experience was recorded in June of this year at the Iridium in New York and is now available on CD courtesy of Deadline Music and Rocker Records. Along with Carmine and Vinny, the Drum Wars Live CD features Jim Crean, Ethan Brosh and James Caputo!